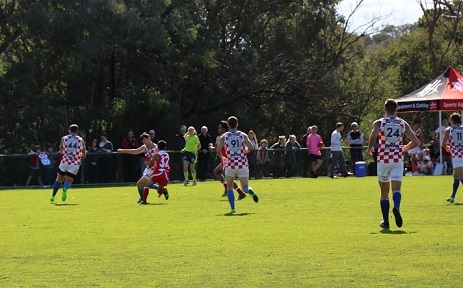 The outer North-Eastern Melbourne suburb of Research – home to Eltham College – played host to a key Division 2 battle. Indonesia started their IC17 campaign with a stirring victory over debutant Sri Lanka; which was a far cry from their introduction in IC14 with 3 successive thumpings at the hands of Nauru, Fiji and France. Croatia on the other hand – had to overcome a slow start against China and came up just short losing by a solitary point. The Knights clearly hold the advantage in squad height and weight and with an older side there were expected to 'flex their muscles' and - that is pretty well how it eventuated - with a 79 point win against an out gunned Gurudas. It was a spectacular day for footy, the wind had held off, the sun was out and the teams were ready and warming up early on. All throughout the day students from the college, and spectators who had gathered for the occasion, were building up excitement about the big game between Croatia and Indonesia in the international cup. The crowd was packed with young students with 'homemade' banners, supporting and cheering for both countries. 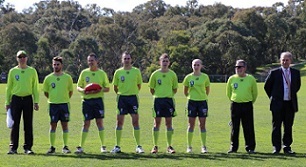 The AFL officials and referees prepared the field and the teams had their eyes set on victory before the game had even commenced. 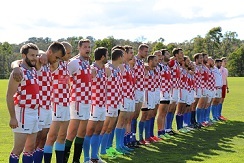 One of the first things that was noticed by all, as soon as you stepped foot on the oval, was the sheer size of the Croatian men. There was an almost comical difference in size between the two teams. People were saying 'It was like boys, against men'. 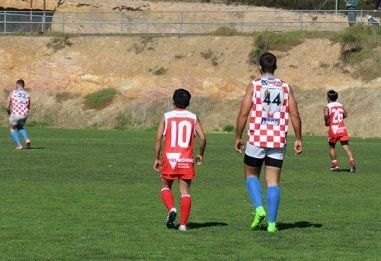 Almost every Indonesian player, was half the size of their direct opponent, and if that wasn't completely accurate, you can bet that they were a third of the weight. The difference in culture of each country was instantly obvious. Croatia was there to win, no mercy and no playing nice. The teams lined up for the national anthem and after Croatia's big men belted out their tune, Indonesia respectively clapped. Yet after Indonesia, who were graceful and in tune, sang their anthem, Croatia gave them nothing. No acknowledgement, not even a clap. Both teams were obviously there to win, but Croatia had their eyes glued to the prize. For those among us who regularly watch the AFL, or play the game ourselves, it was clear that the skill level wasn't amazing, however the teams both played to their athletic strengths. Croatia used their height and size to their advantage, bombing the ball long and producing some beautiful overhead marks all around the ground. They were also able to take their time and compose themselves, as there weren't too many opposition players eager to tackle such large figures. Indonesia fought back in patches, using their speed, agility and vertical leap to try and produce scoring opportunities. They attacked the ball at ground level all day, bursting through packs with quick handballs and sidesteps. 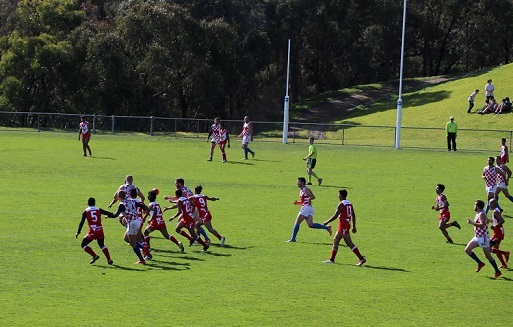 A couple of times, an Indonesian player flew high in an attempt to take a 'hanger', which sparked excitement around the ground. There were a couple of occasions where healthy competition and competitiveness, sparked a brawl, although it was usually after a Croatian 'tank' had come and steamrolled one of the Indonesian players. 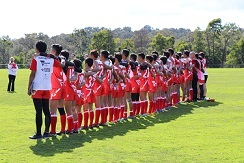 Indonesia's endurance kicked in during the back end of the match, and they kicked their first goal of the day in the third quarter, which had the crowd celebrating and cheering. Though despite their late efforts, Croatia dominated all day, kicking extremely straight, being composed on the ball and taking over head marks almost every inside fifty they had. Croatia ended up winning 91 to 12, after a well-rounded performance. The feeling people got from running water and helping out during the day, was that the Indonesian players were very polite and quiet, and rarely accepted water. The Croatians, who were confident and intimidating, were always ready to have chats and give high fives to officials and helping students during the day. At the end of the match, there was a great feeling all over the ground, as players umpires, kids, students and helpers, went around high fiving and slapping each other on the back after a great game of competitive international football. The Indonesian players, got really involved with some of the younger spectators, playing kick to kick with them after the game and having a bit of fun. Croatia of course, belted out their team song, which was more of a 'manly' chant, and was a spectacle in itself. 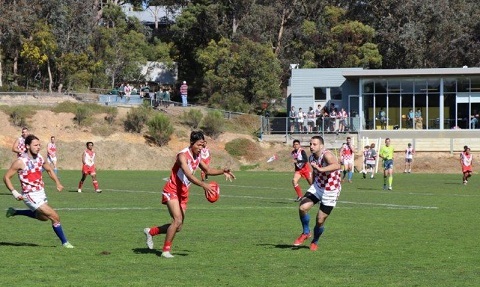 It showed the community how much this opportunity to play AFL in Australia and represent their country meant to them, and showed us all how possible and exciting the idea of having 'Australia's game' expand to the global stage, really is. Many thanks to Lesley Moulin (Year 10 Coordinator) and Lewis for their contributions, story and photos. Great job on the article thanks Lewis. Yes well done Lewis. Great to have a student perspective. Thanks for organising Michael.